MANILA, Philippines – The August 2018 Physical Therapist (PT) and Occupational Therapist (OT) board exam results to include the list of passers, top 10 (topnotchers), top performing schools and performance of schools are released online on Wednesday, August 15, 2018 or in three (3) working days after the exam. The Professional Regulation Commission (PRC) and the Board of Physical and Occupational Therapy conducted the licensure exam in Manila, Baguio and Cebu on August 11 and 12, 2018. From August 29 to August 31, 2018, registration for the issuance of Professional Identification Card (ID) and Certificate of Registration will be done online. Please go to www.prc.gov.ph and follow instructions for initial registration. PT examination covers the following subjects: basic sciences, medical and surgical condition, pathology, physical therapy applications, electrotherapy, therapeutics exercises and principles rehabilitation and hydrotherapy. OT exam covers basic sciences, general medical and surgical conditions and occupational therapy applications programs, organization and administration in rehabilitation psychosocial dysfunction and physical disabilities. According to PRC Resolution No. 2017-1068, the target date of release of Physical and Occupational therapist board exam results is on Wednesday, August 15, 2018 or in three (3) working days after the exam. In the same period last year, PRC announced results in just two (2) working days. 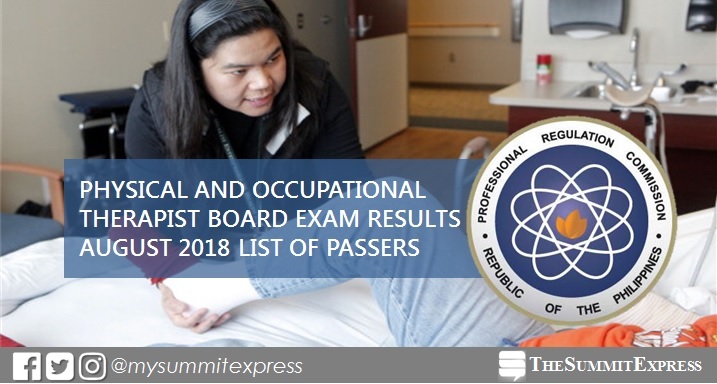 PRC named 802 out of 1,277 who passed the Physical Therapist Licensure Examination and 215 out of 295 for the Occupational Therapist Licensure Examination. In the August 2016 exams, results were out in three (3) working days. 846 out of 1,243 passed the PT board exam and 114 out of 229 passed the OT licensure exams.